We are pleased to announce the new MK9000CF Winch from MaxKraft. The MK9000CF is a high-speed winch equipped with a performance series wound motor, which provides 9,000lbs of pulling power to spool the cable at faster speeds, so that is ready for any challenges that you may face in your vehicle, against extreme terrains. Our new MK2500CF is a fast winch equipped with a powerful permanent magnetic motor, which provides huge pulling power to spool the cable at faster speeds. The MK 2500CF is suitable for cars, for hunting and for leisure pursuits - but particularly for installation on Quads and ATVs. These are vehicles with a great multitude of uses and with which even the most experienced of drivers can sometimes find themselves stretched to their limits in difficult terrain. 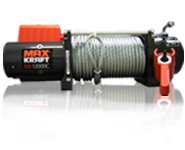 In order to be able to lift yourself beyond these limits - you need a MaxKraft cable winch. When it comes to MaxKraft winches, particular emphasis is placed on user-friendly and designing sturdy, high-quality products. The design of MaxKraft winches has been enhanced and improved in many ways as compared to conventional winches. Great importance has been attached to both quality and economical production during the development of the MaxKraft winches.Moreover, a strong emphasis has been placed on the high price-performance ratio of MaxKraft products. 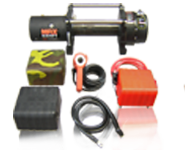 MaxKraft winches were enhanced and improved in numerous details. For example, overall quality was significantly improved through the use of reinforced gearing and motors, break-proof remote controls, as well as high-quality steel screws and housing members. The MaxKraft team has also focused on customer requests in terms of design. 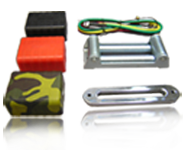 Every winch is supplied with 3 control box housings in different colours. The orange-coloured cover is the original cover mounted on the magnet box. Orange and black are the colours of MaxKraft. The right selection of packaging for damage-free transport and storage is of equally high importance as the specification of the winches themselves. For this reason, MaxKraft winches are delivered in 2 cartons.